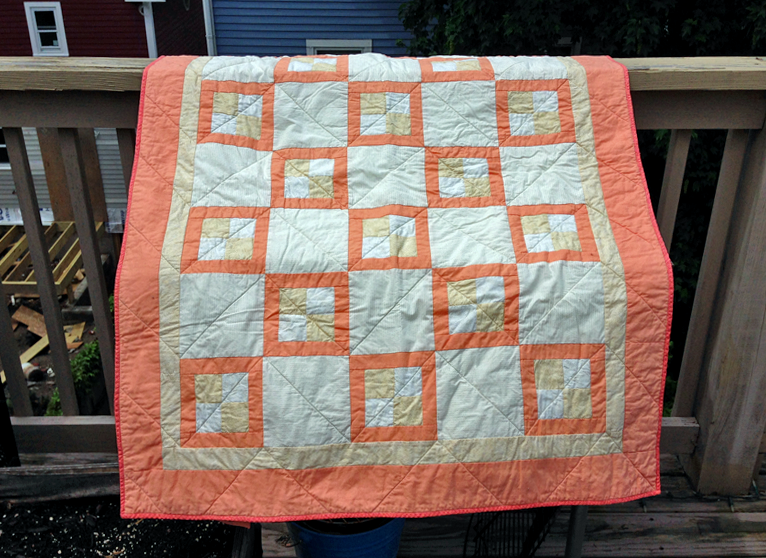 Peach and Gold Quilt: It is done. Washed, dried, and wrinkly. A lot of quilters seem to love this look, but I’m still undecided. I think I like the crispness of the stitching before it’s run through the washing machine. Thoughts? 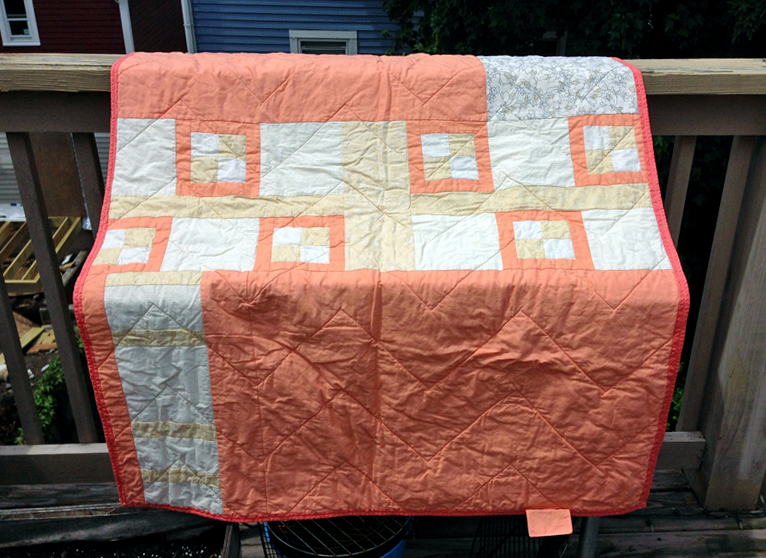 Finished size: I’ve been holding this post up for over a week because I packed this quilt away already. Rather than holding it up even longer, I’m going to say: lap size! PATTERN: Four-patch with border, provided by the Cambridge Quilt Shop as part of their friendly, encouraging, very helpful Start Quilting class. I basically bought a sewing machine and showed up at this class, and I ended up with a quilt. Highly recommended. FABRIC: If you’re looking for similar fabrics, I bought everything for this quilt at the Cambridge Quilt Shop except for the bit of Carolyn Friedlander Botanics on the back. The solid peach is Kona Cotton in Salmon; the two fabrics for the four-patch (the ones with randomly placed tiny gold dots) are Hoffman Brilliant Blenders in white gold and ivory gold; the large neutral squares are similar fabric with more orderly rows of tiny gold dots; a large scrap of Carolyn Friedlander Botanics Foliage in Charcoal shows up on the back; the quilt is bound with a coral fabric with tiny peach dashes on it Dear Stella in Ticking Stripe (Coral).